Did a Secret Service Agent Kill JFK by Accident? You are here: Home › Further Reading › JFK Assassination FAQs › Did a Secret Service Agent Kill JFK by Accident? A TV show in 2013 repeated a claim from 1992 that had been thoroughly debunked. The agent, George Hickey, sued the publisher and author and received an out of court payment. One of the earliest conspiracy theories suggested that the driver of the presidential limousine, a Secret Service agent named William Greer, shot JFK. Later theorists pointed to the many witnesses who stated that the car stopped momentarily during the motorcade. It was claimed that the driver stopped the car deliberately to allow the fatal head shot to be fired by another conspirator, and that the Zapruder film was altered to conceal this event. Both theories were ludicrous, and were easily disproved. Another theory emerged, however, which suggested that a Secret Service agent in the car immediately behind President Kennedy fired his rifle by accident, hitting JFK in the head. The theory was proposed by a firearms expert, Howard Donahue, whose interest in the ballistics aspects of the JFK assassination led him to point out several problems with the official account. As far as can be deduced from the poor state of the medical evidence, the damage to President Kennedy’s head appears to have been caused by a soft–nosed bullet, a type designed to break into fragments on impact. The wounds to Kennedy’s and Governor Connally’s torsos, however, were caused by metal–jacketed bullets, a type designed to remain intact on impact. The bullet and bullet shells that were discovered on the sixth floor of the Texas School Book Depository were of the latter type. President Kennedy’s head wound cannot, therefore, have been caused by the rifle that was also discovered on the sixth floor. The nature of the head wound implies that more than one gunman took part in the assassination. The pathologists who conducted President Kennedy’s autopsy claimed that there was a bullet entrance wound low down on the back of the president’s head. The Warren Commission accepted their evidence, but failed to recognise that an entrance wound in this location, when combined with the much larger wound high on the skull that was presumed to be the point of exit, is incompatible with a shot from Lee Harvey Oswald’s supposed location, sixty feet (18 metres) above the road. Again, the implication is that the head wound was not caused by a shot from the sixth floor, and more than one gunman was involved. The House Select Committee on Assassinations in the late 1970s arbitrarily moved the entrance wound up by four inches or ten centimetres, against the strong objections of the pathologists, so that the two wounds could now line up with the sixth floor of the TSBD. Donahue examined the work of Thomas Canning, the scientist who devised the new trajectory, and found that Canning’s assumptions about the angle of JFK’s head were poorly supported, and that the revised trajectory of the bullet was almost certainly incorrect. Donahue looked around for a possible source of a bullet of the correct type that could have entered the back of President Kennedy’s head at a suitable angle. His solution was that the bullet had been fired by a Secret Service agent, George Hickey, who was riding on the back seat of the car immediately behind the presidential limousine. Between Hickey and his colleague, Glen Bennett, lay an automatic rifle, a Colt AR–15, which was loaded with thin–metal–jacketed bullets. A photograph of the car, taken on Stemmons Freeway less than a minute after the assassination, shows Hickey standing up and holding the rifle. Donahue was impressed by the statement of a witness, Sam Holland, who claimed that a Secret Service agent in the car had stood up and raised his gun at about the time of the fatal shot. Donahue’s story was taken up by a journalist, Bonar Menninger, who published his account in a book, Mortal Error: The Shot That Killed JFK (St. Martin’s Press, 1992). “Find something interesting?” Minetree asked as he browsed amid the gun cases. Although the majority of Mortal Error is written in a superficial, tabloid style, it also contains a postscript by the publisher, which discusses the technical aspects of Donahue’s work in detail and is worth reading. With the publication of Menninger’s book, several problems with Donahue’s account became apparent. Although Donahue was knowledgeable about ballistics, he appeared to be unfamiliar with much of the fundamental evidence to do with the JFK assassination. For example, he assumed that Oswald had been on the sixth floor of the TSBD during the assassination, that Oswald had fired three shots, and that the single–bullet theory was credible. All three assumptions are contradicted by the balance of the evidence and are accepted these days by very few specialists, although they still feature in media accounts of the assassination. Dozens of witnesses were able to see George Hickey when the fatal shot was fired. None of the witnesses claimed that Hickey had fired the shot. A home movie by a spectator, Charles Bronson, shows that Hickey was neither standing up nor pointing his rifle at President Kennedy at the instant of the fatal shot. Charles Bronson had been standing on the concrete peristyle at the south–western corner of the junction of Houston Street and Main Street. When Bronson captured the head shot on film, he was about 60 yards from Kennedy, and almost directly opposite Abraham Zapruder. This portion of Bronson’s film lasts only two seconds, and is of inferior quality to the Zapruder film. George Hickey is visible, on the third row of seats at the back of the Secret Service car. His gun is not visible. Immediately in front of Hickey was President Kennedy’s political associate, Kenneth O’Donnell. In front of O’Donnell was the driver, Sam Kinney. In front of Kinney, and extending beyond the top of Kinney’s head, was the car’s windscreen, with both visors raised. To shoot President Kennedy, Hickey would have had to stand up or raise his gun to at least the level of his head, and the film shows that he does neither. At the end of the last report [i.e. the final shot] I reached to the bottom of the car and picked up the AR 15 rifle, cocked and loaded it, and turned to the rear. At this point the cars were passing under the over–pass and as a result we had left the scene of the shooting. I kept the AR 15 rifle ready as we proceeded at a high rate of speed to the hospital. The real significance of Bronson’s film is not that it disproves a far–fetched theory, but that another portion of the film depicts the sixth–floor window from which at least one shot appears to have been fired. This portion of film was taken about five minutes earlier, when the motorcade had been due to arrive and when Lee Oswald was seen on the first (i.e. ground) floor of the building. There is some debate about whether or not the film shows a moving figure, presumably a gunman, behind the window. For more about Charles Bronson’s film and his experience of the assassination, see Richard Trask, Pictures of the Pain , Yeoman Press, 1994, pp.278–304. Selections from Bronson’s film, including an animated GIF (1.9 MB) of the head–shot sequence, can be found at http://www.jfkassassinationgallery.com/thumbnails.php?album=15. The Mary Ferrell Foundation website gives links to online versions of all the known home movies of the assassination. Were it not for the significance of the events, some discussions would just be funny (like Bonar Menninger’s 1992 book arguing that a Secret Service agent just happened to accidentally shoot Kennedy in the head while Oswald was coincidentally shooting at him, i.e., the only accidental discharge of a Secret Service weapon around a President in one hundred years would by chance hit the President in the head and would by chance occur in the six or so seconds during which someone else was shooting at the President). Gibson might have added a further coincidence: the fact that the accidental discharge just happened to cause a wound that could not have been caused by a lone gunman. By 1992, the lone–assassin hypothesis had been undermined by nearly three decades of criticism, culminating in Oliver Stone’s film, JFK , which had just been released. A politically acceptable non–conspiratorial explanation was required, and Mortal Error just happened to provide it. It is rare for any JFK assassination theory, no matter how outlandish, to be conclusively disproved. Even the theory that Lee Oswald played an active part in the assassination, which these days is believed by few serious researchers, and the theory that Kennedy was hit by a dart fired from a spectator’s umbrella, which is believed by almost no–one, have not been conclusively disproved. But the ‘Secret Service agent shot JFK by accident’ theory is most certainly wrong: there is actually a film of the agent not shooting JFK. In short, President Kennedy was not killed by a Secret Service agent, deliberately or accidentally. George Hickey, the Secret Service agent named as President Kennedy’s unwitting assassin, began a law suit against Donahue, Menninger, and St. Martin’s Press. Hickey claimed that they had been shown Bronson’s film several months before the publication of the book, and that they were aware that the film conclusively disproved their theory. Hickey’s case was rejected by the judge on a technicality, but he was reported to have accepted an out–of–court payment for damages (see e.g. Michael James, ‘Lawsuit is settled in favor of former Secret Service agent; book claimed man accidentally fired bullet that killed Kennedy,’ Baltimore Sun , 3 February 1998). Not only did publication of Bonar Menninger’s Mortal Error go ahead, but the book was widely and sympathetically reviewed in the press. 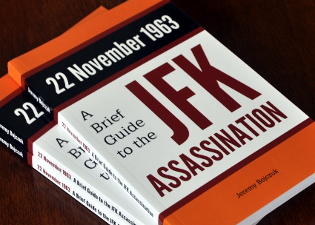 As is usually the case with books about the JFK assassination, almost none of the reviewers had sufficient knowledge of the assassination to identify the book’s fundamental weakness. Two decades later, and just a couple of years after George Hickey’s death removed the threat of another legal challenge, a film company decided to cash in by reviving Howard Donahue’s discredited theory. JFK: The Smoking Gun was one of many pot–boiler films released in time for the fiftieth anniversary in 2013. The film is at least partly fictional, using CGI animations that are based on incorrect data, and features the work of a police detective whose powerful investigative skills allow him to solve the crime of the century. Our master sleuth deduces that … wait for it … JFK was shot accidentally by a Secret Service agent in the car behind him! and the nature of President Kennedy’s head wounds, which implied that the fatal shot came from somewhere other than the sixth floor of the TSBD. The same thoroughly discredited theory popped up again in a television programme called JFK’s Secret Killer , which apparently dealt with the inconvenient evidence of Charles Bronson’s home movie in the safest way possible, by simply ignoring it. JFK’s Secret Killer was the only programme on British television during the week of the fiftieth anniversary which offered any analysis of the shooting. Observers who are familiar with the media’s coverage of the JFK assassination were, as usual, appalled but not surprised. Viewers who are unfamiliar with the facts of the assassination were, as usual, misled. Forget about those silly conspiracy theories! Even if you suspect that the lone–nut theory is nonsense, there is now a perfectly good non–conspiratorial explanation for the assassination. It was just an accident! and it allows the media to continue to ignore the evidence of Oswald’s impersonation in Mexico City, the event which prompted the adoption of the lone–nut hypothesis. For a comprehensive demolition of JFK: The Smoking Gun , see http://www.patspeer.com/the–smoking–gun–that–lied, which details the film’s misuse of witness testimony and its misrepresentation of the medical evidence. Speer also covers the rest of the media’s 50th anniversary output. I have been involved in research and issues involving the JFK assassination for almost 40 years …. I have represented numerous JFK authors/researchers, given numerous speeches and media appearances, and helped secure the declassification of thousands of records. This is one of the most BS theories that has ever been promoted and anyone who believes it is a complete moron. For a discussion of Mortal Error ’s place in the JFK literature, see Fiction, Propaganda and the Media. What is the Case For a Conspiracy?